Do you want to prevent website data loss? Does backing up your website take too much time and space? 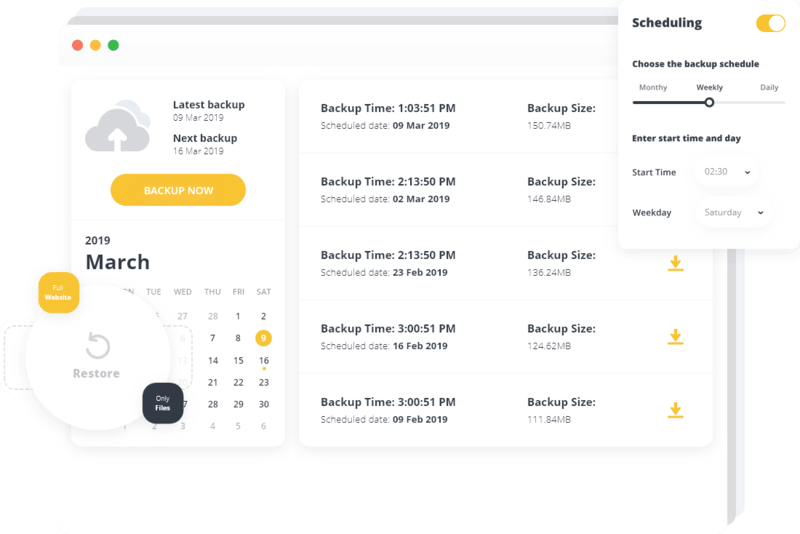 Do you want to schedule automatic website backups? Are you having trouble choosing the right backup service? Perform a full backup or backup the DB and files separately. Schedule daily, weekly or monthly automatic backups. Allows backing up only the changes made after the last backup. Download and view all the details of your backups. Get free 10Web cloud storage in Amazon S3. Choose the format of your backed up files - Zip, Tar, Tar GZip or Tar BZip2. Restore the backed up version of your website with a click. This backup service is everything I was looking for. It’s super fast and effective and really easy to use. The customer care is also very responsive, nice and helpful! Highly recommended! Simply the best backup! Works like a charm. Intuitive interface. Actually backs up in one click. The restoration is just as good. This service is just great. It’s super easy to set up and use, works fast and flawlessly. The scheduling options are very exciting. Loved it! Sign up and backup your website in cloud absolutely for free. Backup Service is a part of 10Web Platform.